At Project Morry, we believe that together we can make a difference. Every dollar you raise will help us provide valuable experiences and learning opportunities to young people, including a terrific summer camp experience. There’s also a lot of fun in fundraising! Get your friends and family together, tell them about Project Morry, have some fun, and make a meaningful contribution. We love support from Kids that Give and we’re proud to help cultivate our community’s next generation of volunteers, Board members and supporters. Check back soon for some great new fundraising opportunities we're working on. Instead of presents (or maybe as well as!) celebrate your birthday, bar or bat mitzvah, or graduation with an opportunity for your friends and family to make a donation that gives back to your community. If you’re into baking, swimming, know a great recipe for lemonade, or have another great fundraising idea, get your friends, family, sports club or school to support your project and raise funds for Project Morry. How does fundraising make a difference? 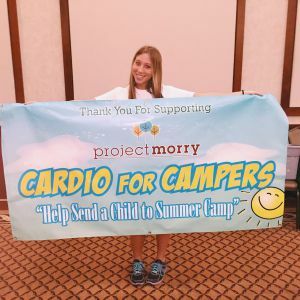 In 1995, Project Morry started to share the amazing summer camp experience with young people who normally wouldn’t have the opportunity to experience camp. Today, as well as Morry’s Camp, we provide hundreds of young people from underserved communities with the year-round support they need to help them succeed in high school and beyond. So, you’d love to create your own fundraiser for Project Morry? Terrific! We have everything you need to get started, including ideas and ways to increase your donations. Here are some popular fundraising ideas, but you are welcome to get creative and come up with your own. Complete the Kids that Give application online. Our team will come back to you with any questions. If you have any questions email us at dream@projectmorry.org. Once we have approved your application, we’ll set up a fundraising page for you to start fundraising. Our bank details – to send us a check with the funds you’ve raised after your activity or event. After your event, please deposit your funds within 14 days. Our Project Morry team will then be in touch with your receipt and to say a huge ‘thank you’! We’ll also ask if you’d like to add your story to our website.